The British Touring Car Championship came to its conclusion last week, with the Honda Yuasa Racing Team’s Gordon Shedden taking the crown in the penultimate race of the season. Sunday’s race day also saw first time winners in Frank Wrathall and Aron Smith as part of an enthralling weekend of motorsport. Scotsman Shedden went into Sunday’s second race knowing that a lead of at least 22 points going into the final 15 laps at Brands Hatch would ensure him the BTCC crown; coming second behind teammate Matt Neal made sure of that and put him out of reach. Wrathall, Neal and Aron Smith took their respective victories on the day, whilst the man going into the weekend second in the championship, Jason Plato, endured a miserable final day. The MG KX Momentum Racing driver struggled to eighth in the first race and couldn’t pick up the pace as a wet Brands Hatch GP track became trickier with the increasing rain, finishing third overall in the championship. Shedden becomes the first Scotsman to bring home the title since John Cleland in 1995 and the 33-year-old admits it is an honour to follow in the footsteps of his hero. The driver told the press: “All I ever wanted as a kid was to race touring cars. “It was never about F1 – and it was John Cleland who was my hero when I used to go and catch a glimpse of the BTCC at my home track at Knockhill. “I never thought I’d ever get the chance to race them though, let alone win a race. Now I’m the champion, and it is mind blowing… What a season, not just for myself, but for everyone at Honda. 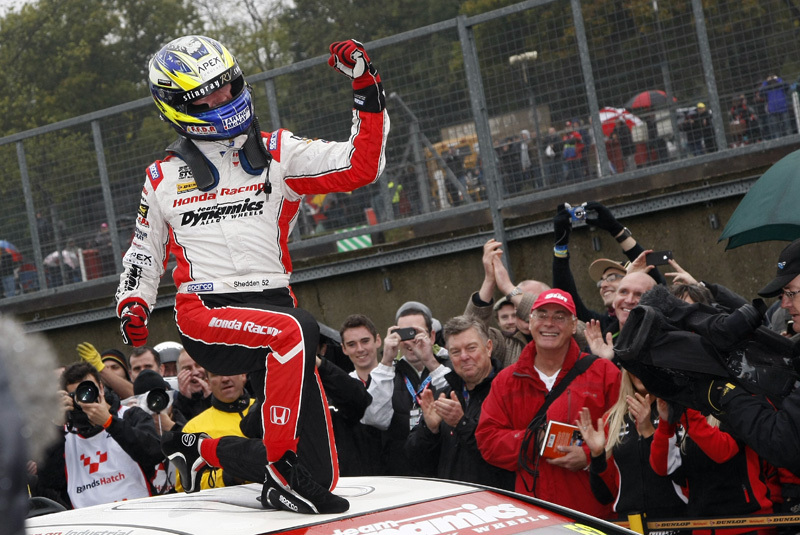 Honda savoured Sunday, as they made a clean sweep of all five BTCC titles. The Pirtek team picked up the Independent team trophy, whilst Yuasa took the outright HIQ title and Honda/Dynamics the Manufacturers/Constructors Championship. Along with Shedden’s individual win, Andrew Jordan took the Independent Drivers Championship to make it five.